It was December 10th 2012 and I was dying, my vision was hazy, my arms were numb,my heart was pounding and I could feel my pulse in my throat. I felt as faint as the damsel tied to the railway lines but remained frustratingly conscious.Terror had gripped every fibre of my being as I waited for death-but I wasn’t dying i was having my first panic attack. Calm, good in a crisis, everyone’s go to gal had lost it in spectacular style. years of hiding my emotions of trying to be a Kirstie Allsop/Nigella/super mummy hybrid and childhood abuse that I thought long forgotten had repeatedly kicked my brain until it finally lay down and quit. The weeks that followed were the hardest I have ever lived (even the ones when I had cancer) taking rubbish to the bin a mere 20 feet away was terrifying, the ground would seem miles away and I was consumed with the fear of collapsing. In desperation I went to A and E twice, to the gp twice until I got an appointment with the doctor who knew me best, quietly and sympathetically he asked a few questions and diagnosed panic disorder and depression. he upped the antidepressant that I take for pain control and told me I would wait 10 weeks for talking therapy. he may as well have asked me to fly, I took the decision to see a psychotherapist privately, surely the wisest decision I have ever taken and I started to recover. Fast forward 2 years and here we are, with me starting a little painting and crafting business and with this blog. I will be talking about painting but not too often, I will share my pick of crafty gorgeousness I find on the web,it will have my pick of bags and beauty, and some foolproof make it with your eyes shut recipes that i have found and rely on, and a tiny bit of gardening which I hate but I do prefer flowers to weeds! The blog will evolve over time and get prettier and easier to use but it was really important to get it up today! And where does my headline come from? the beautiful bag below made by http://www.itsnotmeitsyoulondon.com it really summed up how I felt at the beginning of this tale. 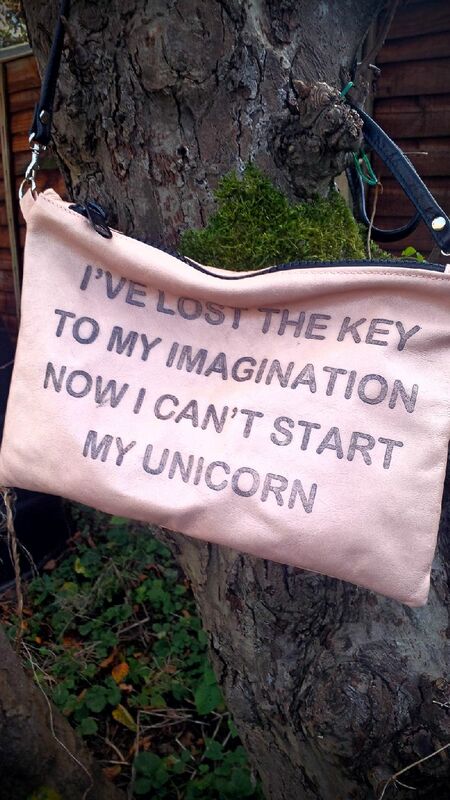 So join me if you will, hold on tight and lets see how this unicorn handles! ps please share any stories you have of losing your key as I discussed my problems with people, I realised I was not alone and it really does help to share. This entry was posted in Uncategorized and tagged art, craft, gardening, panic attack, portraits by karenlorenz. Bookmark the permalink.